The Fluidwell D010 model is a DIN panel mount indicator which displays the actual flow rate, in user-selectable engineering units. The display features very large 1" digits as well as a piegraph indicator with 10 segments. Aluminium front enclosure offering IP67 (NEMA4X) protection from the front. Battery powered model, approx 5 year battery life depending on settings. Can also be powered by 8-30vDC, no sensor supply. 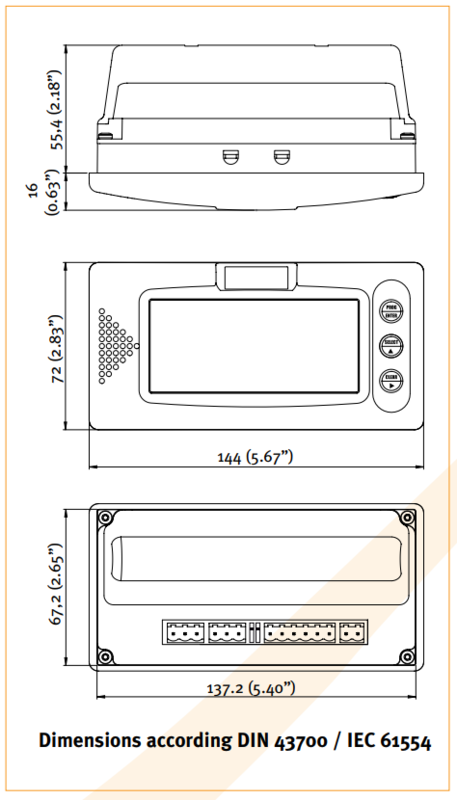 Aluminum DIN front panel of 144 x 72mm (5.67" x 2.83") according DIN 43700 / IEC 61554.